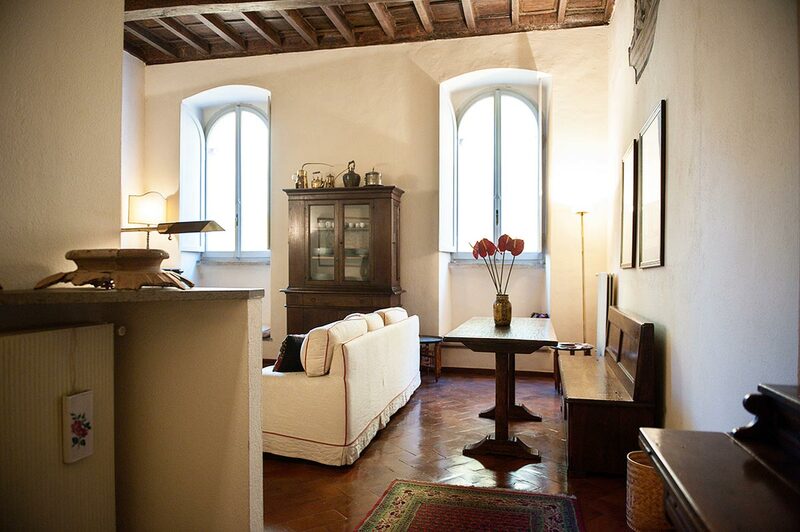 The Navona family apartment is all on one level, and sits on the third floor of a lovely building without a lift. 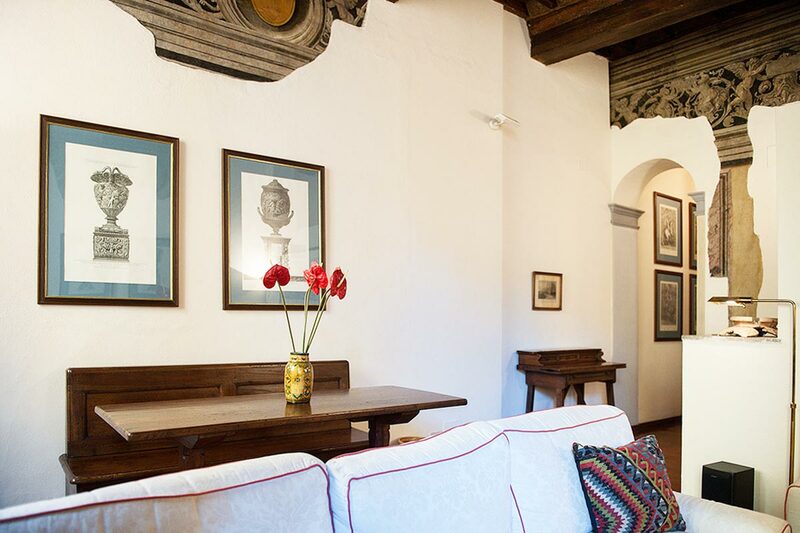 The property’s decor boasts original Roman character, with exposed wooden beams and beautiful frescoes decorating the walls. 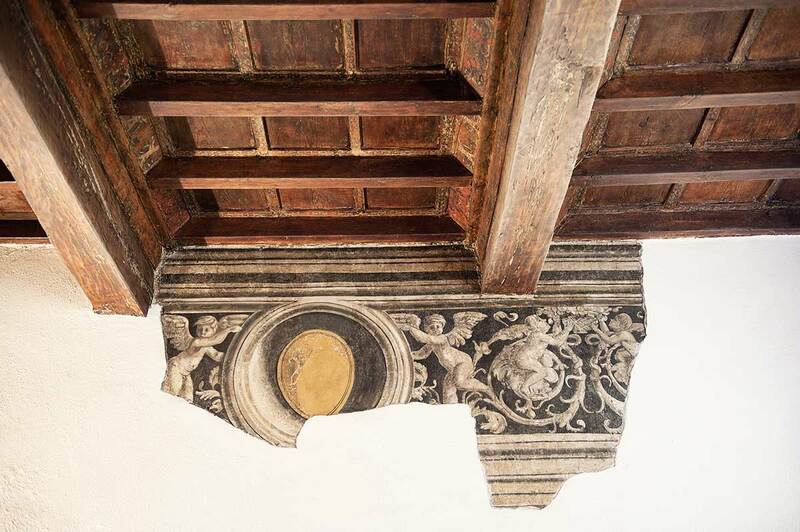 Altogether, its interiors make for a timeless elegance and charm. 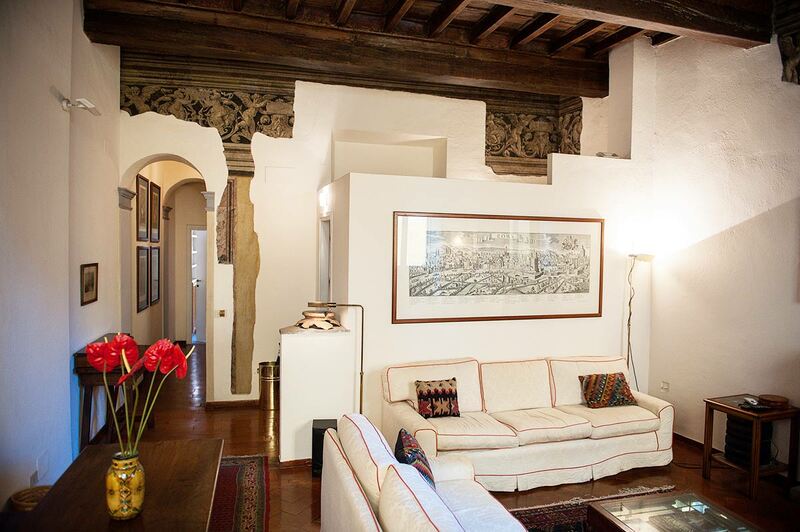 The furnishings are in neutral colors with whitewashed walls and traditional cotto tiled floors. This creates a simple yet tasteful space, full of light. 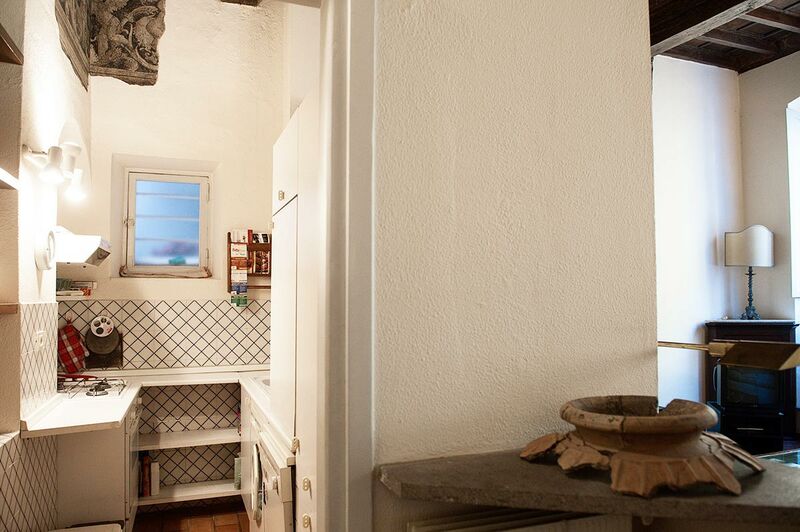 Upon entering the apartment, a corridor leads you to the kitchen. This provides everything you could need to prepare a delicious home-cooked meal. 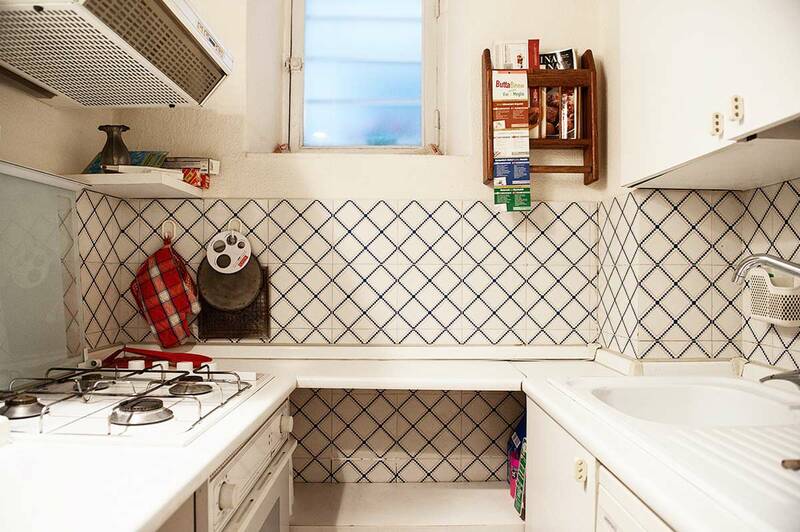 You will have access to an oven, gas hob, toaster, kettle, dishwasher, washing machine, and sink. 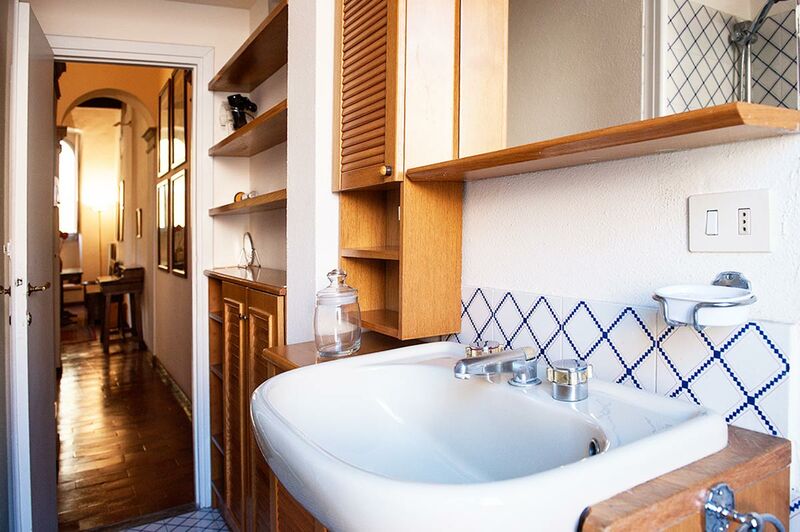 Of course, all necessary utensils and crockery will also be at your disposal. Around the corner from the kitchen area is the living room. 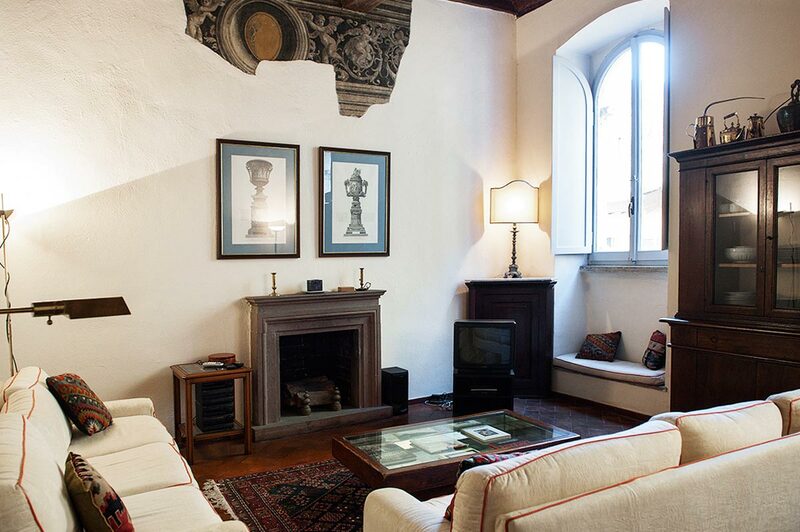 This is cozily furnished with two comfortable single sofa beds, a low glass coffee table and television. Furthermore you can enjoy the unique window seat, and stone fireplace. This is perfect for an evening drinking wine by the fire. 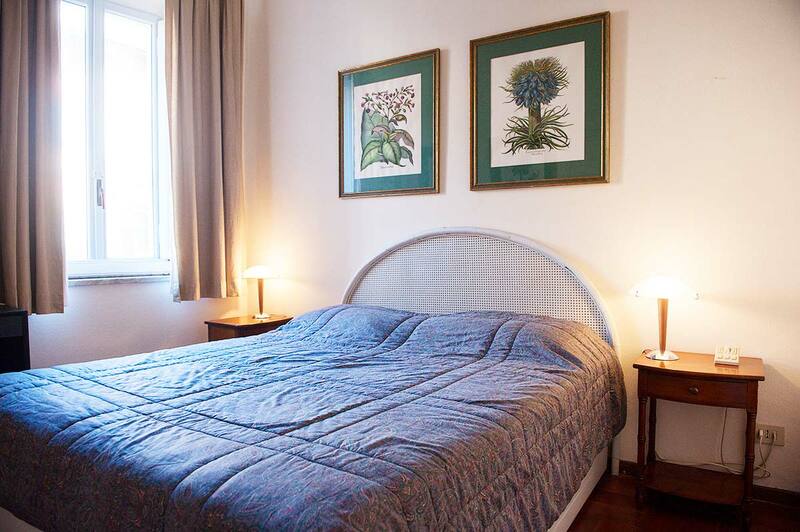 The bedroom has a king size bed and a white-tiled bathroom with wooden shelving, offering plenty of storage space. 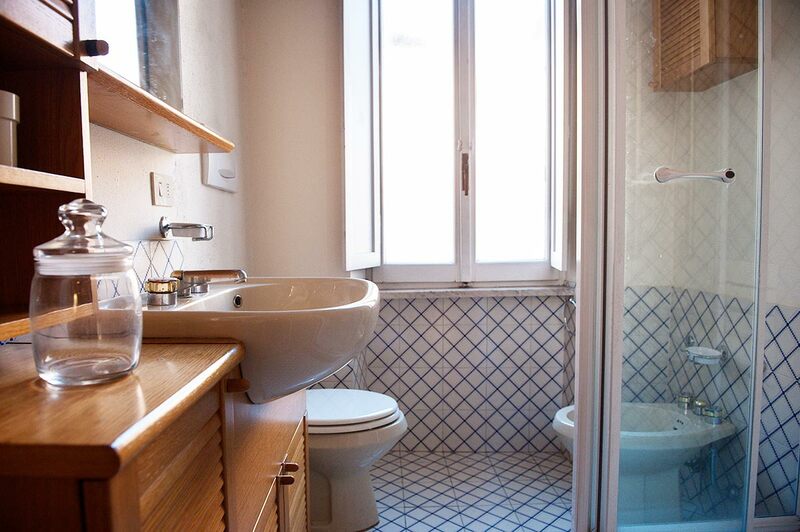 Here there is a sink and shower cubicle. 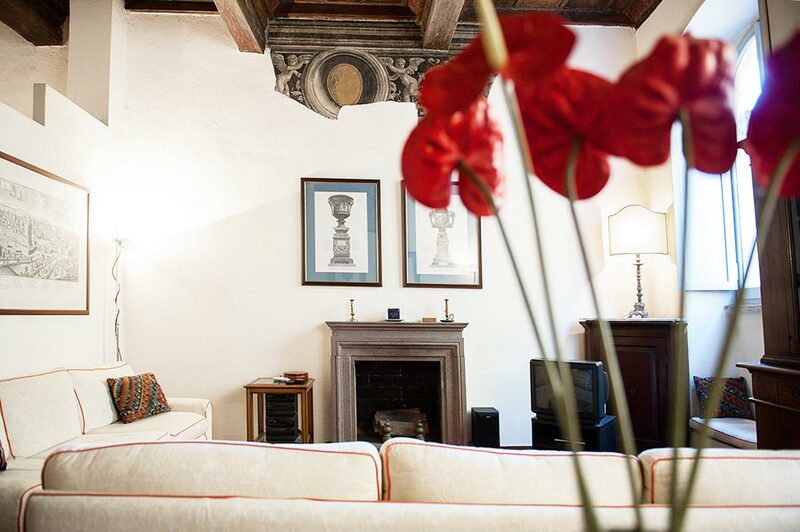 This pretty Navona family apartment is a steal for an idyllic couple’s retreat in the heart of the Eternal City, or for a great family holiday! 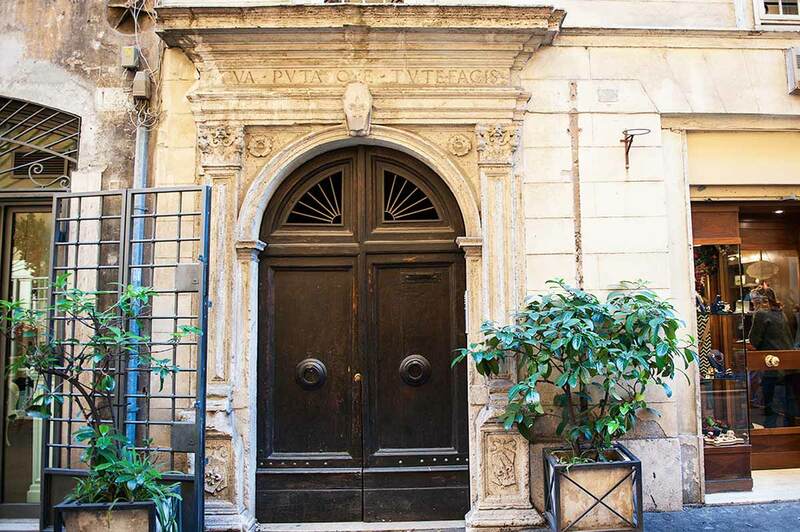 This apartment is only 300 meters from the world-famous Piazza Navona. 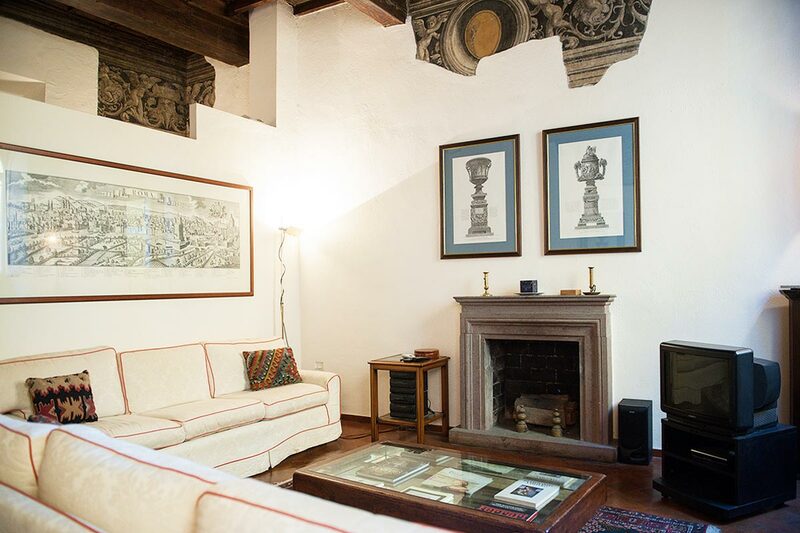 It is also a mere 600 meters from the beautiful and lively square of Campo de Fiori. Furthermore, just set back from the river, you are very close to some of Rome’s most striking buildings. For example, a short walk will bring you to both Castel Sant’Angelo and St Peter’s Basilica. When visiting the Vatican’s museums, make sure to arrive well ahead of time so as not to get caught up in the queues! 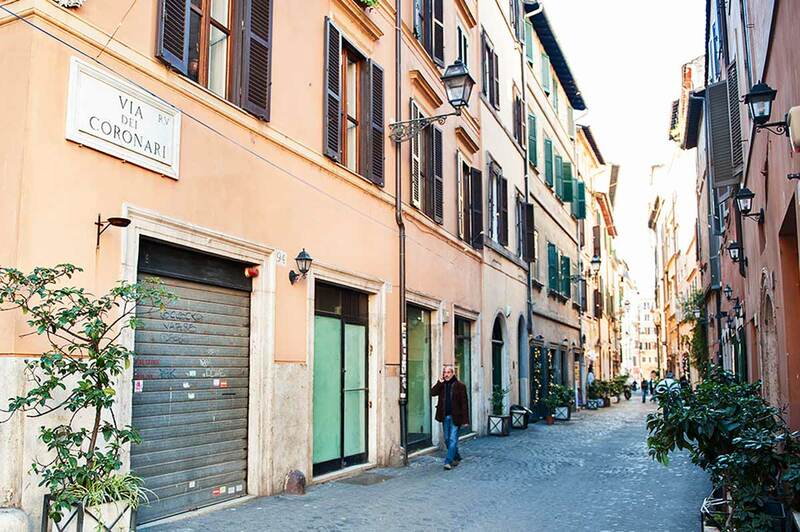 In the other direction you will find the charming area of Campo de Fiori. In particular, this neighborhood retains a strong sense of local life. Here you can also find small, traditional restaurants, boutique shops and daily fresh produce markets. Why not come here to pick up any ingredients you may need to cook a delicious meal in the evening? Just a short walk from here will bring you to the Jewish Ghetto, where you can find many more traditional Roman cuisine restaurants. One of the most famous dishes here is the artichoke. This comes prepared in many different ways depending on the restaurants but tend to be deep-fried and seasoned. This is also the place to go should you require kosher meals as the majority of restaurants will offer such varieties. 5 people are currently looking for apartments in area. Reserve yours now.